Juice cleanse benefits include weight loss, health benefits, and detox (remove toxins from the system). “Juicing” is becoming popular and using juices to cleanse is gaining more and more momentum. If youâ€™re thinking about doing a cleanse, you might have a few questions. What exactly is it? What are juice cleanse benefits? How can I make sure I get the most out of it? Letâ€™s start with the basics. Organic juice cleanses, green juice cleanses, carrot juice cleanses, juice fastingâ€¦ youâ€™ve heard a lot of people talking about them for weight loss and health purposes but what exactly is a juice cleanse? The truth is, itâ€™s not as simple as it sounds. The simple definition is itâ€™s a period of time when you limit your diet to only fruit and vegetable juices. They can last days or weeks depending on how committed you are. If youâ€™ve decided to do a juice cleanse and want to do some juicing, bear in mind that itâ€™s not as easy as going to the grocery store and buying juice off of the shelf. Most store-bought juices are full of preservatives and sugar, two things that you do not want to be putting into your body in large volumes. For a juice cleanse to be beneficial to your body, drink only freshly made vegetable and fruit juices. There are a lot of companies that specialize in making juices specifically for juice cleanses. Some of these even include special blends that include almond or other nut-milk to add a little bit of fat and protein. Another option is to make your own fresh juices at home. One of the benefits of juicing at home is that you have complete control of the ingredients. Keep in mind that the juice you make at home is not pasteurized. Make sure you juice in small batches to prevent any problems with bacteria or other organisms. In summary, a juice cleanse is more than just drinking juice and not eating for a few days. The kind of juice you drink is actually really important. While a juice cleanse isnâ€™t a magic cure for anything, there are some significant benefits to doing one. 1) You add a lot of fruit and vegetables to your diet. 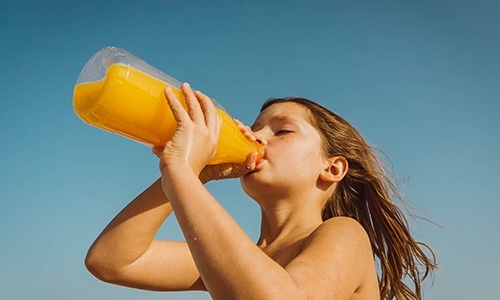 Remember, youâ€™re not drinking the juice you buy off the shelf at the grocery store thatâ€™s been overly processed and has a lot of added sugar and preservatives. The fresh pressed juice you drink during a cleanse is made of nothing but fresh fruit and vegetables. Most people donâ€™t get the recommended intake of 5 to 13 fruits and vegetables a day when eating normally. Drinking this amount of fresh juice really makes it easy to meet this goal. Truth be told, youâ€™ll probably surpass it. 2) It can help you break old habits and make new ones. If you successfully stick to the cleanse, it can help you work through any bad habits or cravings you have. One good example is sugar. Sugar is increasingly believed to cause a myriad of problems and is believed to be addictive. If you suffer from intense sugar cravings or an outright addiction, drinking vegetable juice can help you get through the beginning of a sugar detox. After a few days, add some apples and introduce other fruit slowly. A juice cleanse could be just the help you need to get past your sugar habit. 3)Â You have more energy. A day or 2 into your cleanse, your body will have digested all the food that was left in your GI tract. Even though digestion is a passive processâ€”your body does it without you telling it toâ€”it still uses a lot of energy. When thereâ€™s no more food left to digest, that energy is conserved and you might feel like you have a little more pep. 4)Â It can change your attitude toward food. If you are able to successfully complete a juice cleanse, you should be proud of yourself. Itâ€™s not an easy thing to do and pushing yourself through to the end is an accomplishment. Sometimes, when it comes to eating healthily, we all need a push in the right direction. Itâ€™s possible that the positive feelings that come from completing a juice cleanse will continue once itâ€™s over and encourage you to make healthier choices. Listen to your body. Itâ€™s not always possible to predict how youâ€™ll react to a juice cleanse and some people have a more severe reaction than others. If you feel tired, make sure you take it easy and make time to rest during the day. Drink water. Most people donâ€™t drink the recommended amount of water they need on a daily basis but itâ€™s really important to stay hydrated during a juice cleanse. Itâ€™s recommended that you drink half your body weight in ounces during a juice cleanse. If youâ€™re finding it too difficult, there are juice cleanses that also allow you to eat some raw food that might be worth looking into. Be careful how you reintroduce food after your cleanse. No matter how long your juice cleanse is youâ€™ll likely be ready to eat when itâ€™s done. While it may be tempting to run to your favorite restaurant and eat steak, shrimp or pizza, itâ€™s not the best way to go. Remember that your body has been without solid food for days and itâ€™s best to reintroduce food slowly. A good idea is to start with solid fruit and vegetables or veggie soups. Add some nuts, seeds, and nut milk to your diet for protein. Wait a few days until advancing to lean meat like chicken or pork. Juice cleanses can have tremendous effects on your body but itâ€™s important to do them right. Using fresh juices, staying hydrated, and listening to your body are all key to having a good experience. This is also the best way to make sure youâ€™re getting the top juice cleanse benefits.